If you shoot lot of pictures with your digital camera and have a load of photos then Namexif can help you in renaming these photos. Namexif is a free tool to automatically rename photos with the date they were shot using the EXIF data present in your photos. The Namexif offers renaming in three formats YYMMDDHHMMSS, YYYY-MM-DD-HHhMMmSS and YYYY-MM-DD HH.MM.SS. Here YYYY stands for year, MM for month, DD for date, HH for hours (in 24h clock), MM again for minutes and SS for seconds. Namexif would be able to rename only when the photos are captured using the EXIF compliant camera else the original name would be retained. 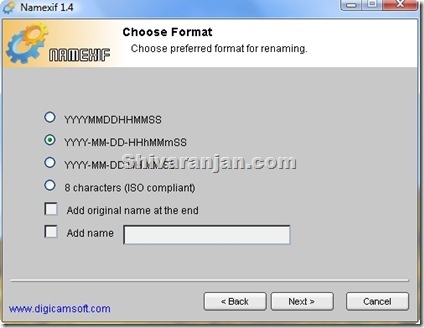 There is also an option using which you can rename the photos that are compliant with ISO 9660 mode 1 file systems so that you don’t have problem in burning CDs. This is a very handy tool if you have lots of photos and would like to rename according to date and time. This way you would have all your photos arranged in chronological order. The next time I read a weblog, I hope that it doesnt disappoint me as considerably as this one. I mean, I know it was my choice to read, but I truly thought youd have one thing intriguing to say. All I hear is actually a bunch of whining about some thing which you could fix should you werent too busy looking for attention.